“Investing in Family Planning is the gift that keeps on giving” – HFG’s Dr. Chris Atim during his presentation on mobilizing domestic resources for family planning. 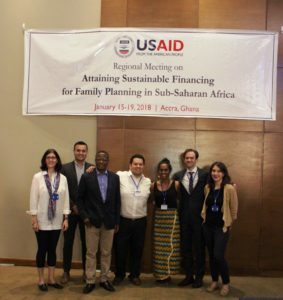 Together with the HP+, SHOPS Plus, PACE, and SIFPO2 projects, HFG led several sessions at a regional meeting titled, “Attaining Sustainable Financing For Family Planning In Sub-Saharan Africa” which occurred the week of January 15th, 2018, in Accra, Ghana. The meeting brought together approximately 120 government stakeholders, USAID staff, and representatives from the civil society and private sector from 14 priority FP2020 countries in sub-Saharan Africa. The meeting aimed to facilitate sharing of country experiences in achieving sustainable financing for family planning (FP), and to discuss practices and tools that can inform financing options for FP and reduce reliance on donor assistance. HFG Cote d’Ivoire Chief of Party Noel Nahounou (far right) presents at the workshop. On the first day of the meeting, HFG’s Nathan Blanchett and Andrew Won facilitated a high-energy, highly participatory session on Health Financing Basics to get participants “up to speed” on some of the major topics that would be discussed the rest of the week. On Day 2, HFG-Ghana’s Chris Atim facilitated a session on domestic resource mobilization (DRM) for FP. The session featured a panel of four speakers: a representative from the Resource Mobilization Unit of the Ministry of Health (MOH)-Ghana, the Director of Budget and Management Accounting from the Ghanaian National Health Insurance Agency, the Advisor on Nursing Policy & Gender for MOH/DRC, and HFG’s own Dr. Noel Nahounou (Chief of Party, Cote d’Ivoire). 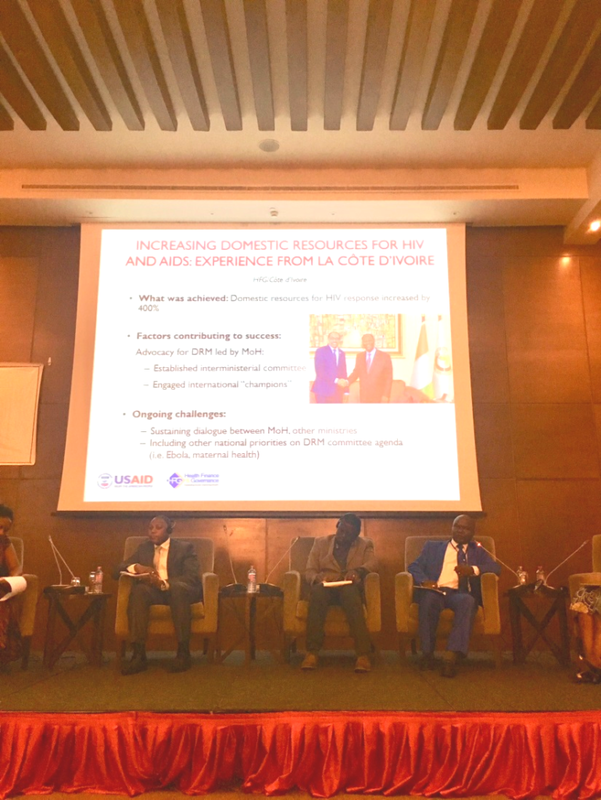 Noel was recommended by the USAID lead of the Cote d’Ivoire delegation to present on CdI’s success in mobilizing resources for HIV/AIDS (which was supported by HFG), and how this experience could be applied to family planning. Both sessions were very well-received and displayed great collaboration and a diversity of experiences from the project. 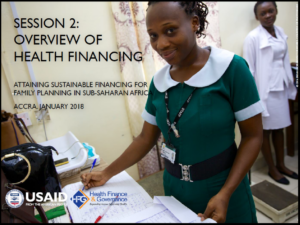 Later in the week, Jeanna Holtz and SHOPS Ghana colleague Joseph Addo-Yobo facilitated two sessions on engaging the private sector in FP financing, and practical lessons on assuring access to high-quality services in the private sector under health financing programs. Throughout the week, country teams identified specific steps they could take to ensure sustainable family planning financing that would complement national strategic plans. At the close of the meeting, they shared their plans and took feedback from others. Summary: Health financing is a powerful lever for countries to use in their progress towards universal health coverage. This session reviewed what health financing is and why it matters for family planning. Participants engaged in a quiz show game to test their knowledge. 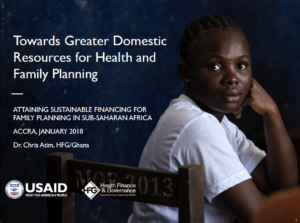 Summary: This session reviewed key considerations for increasing government investments in family planning and provide an overview of what domestic resource mobilization (DRM) is and why it matters. The session offers a deep dive into the different domestic financing mechanisms available, illustrated with country examples. Country teams had the opportunity to share their experiences with domestic resource mobilization and family planning and discuss solutions for “DRM Dilemmas” in a large, multi-stakeholder environment.